SAN JOSE, Calif., Jan. 7, 2019 /PRNewswire/ — MGI, established in 2016 as a subsidiary of global genomics leader BGI Group, announced it has reached a new milestone of 1,000 MGI sequencers installed in 16 countries. 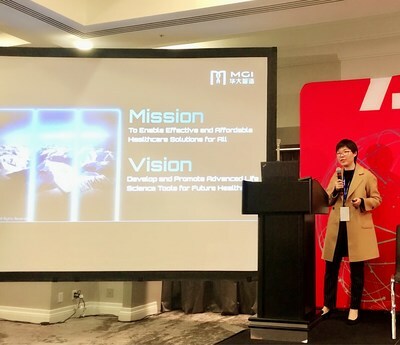 MGI Chief Operating Officer Dr. Hui Jiang also announced the availability of MGI’s early access program for its newest ultra-high-throughput genetic sequencer, MGISEQ-T7, during a presentation at China Focus@JPM Week on the eve of the 37th annual J.P. Morgan Healthcare Conference. The MGISEQ-T7 vastly improves speed, throughput and flexibility of DNA sequencing by enabling simultaneous but independent operation of up to four flow cells in a single run. The innovative quad-flowcell platform allows multiple flow cells with different read lengths and applications to be processed separately at any time. Sequencing of PE150 takes less than 24 hours at full load to complete. The MGI proprietary technologies, including DNBseq™ used in T7, deliver exceptionally high accuracy and improve efficiency through upgrades to the flowcell, fluidics, and biochemical and optical system. The platform can produce up to 6Tb of daily data, equivalent to up to 60 whole human genomes in a single day. MGI’s technology improves the speed, efficiency and affordability of large population health projects. In the past, a 100,000-population-genome program would take four to six years to complete, but now using six MGISEQ-T7 sequencers such projects could be completed in just one year, at much lower cost. The early access program supports collaboration on the development of genetic technologies and applications. It allows customization of instruments and reagents and innovative financial models. MGI is planning to expand this program internationally over the coming year. The MGI platform is gaining support around the world, with more than 135 publications using MGI sequencers and over 20 petabytes of data generated. Besides its sequencer product portfolio, MGI has developed a product portfolio of automated sample preparation workstations to meet the needs of ultra-high-throughput genomic sequencing. 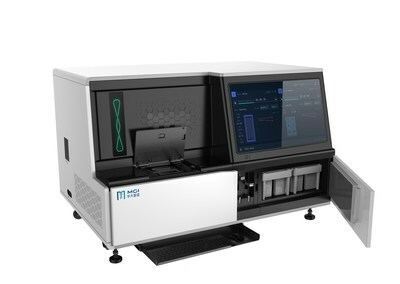 Dr. Jiang also introduced the MGISP workstations series of products for sample preparation, MegaBOLT series of products for accelerating bioinformatics analysis, and ZLIMS software system for lab management with NGS sequencing process. At the J.P. Morgan Healthcare Conference, MGI also announced a global partnership with Paragon Genomics, a leader in amplicon-based target enrichment and library preparation solutions for next-generation sequencing (NGS) assays. MGI will distribute Paragon Genomics’ CleanPlex®NGS Panels for use with MGI’s sequencing platforms in all territories worldwide except the U.S., and Paragon Genomics will distribute MGI’s automated sample preparation workstation systems in the U.S. and Canada. MGI Tech Co., Ltd. (MGI), a subsidiary of BGI Group, is committed to enabling effective and affordable healthcare solutions for all. Based on its proprietary technology, MGI produces sequencing devices, equipment, consumables and reagents to support life science research, medicine and healthcare. MGI’s multi-omics platforms include genetic sequencing, mass spectrometry and medical imaging. Providing real-time, comprehensive, life-long solutions, its mission is to develop and promote advanced life science tools for future healthcare. BGI was founded in 1999 with the vision of using genomics to benefit mankind and has since become one of the largest genomics organizations in the world. With a focus on research and applications in the healthcare, pharmaceutical, conservation and environmental fields, BGI has a proven track record of innovative, high profile research, which has generated more than 2,130 publications. 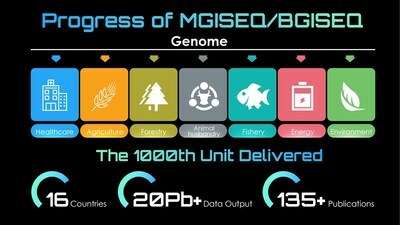 BGI’s goal is to make state-of-the-art genomics highly accessible to the global research community and clinical markets by integrating the industry’s broadest array of leading technologies, including BGI’s own sequencing platform, economies of scale, and expert bioinformatics resources. BGI also offers a wide portfolio of transformative genetic testing products across major diseases, enabling medical providers and patients worldwide to realize the promise of genomics-based diagnostics and personalized healthcare.